When referring to occupations, the word "collar" usually refers to class/income or gender designations. "White collar" is used for professional jobs, “blue collar” for manual labor/working-class jobs, and the phrase "pink collar" is used for fields predominantly occupied by women, such as teaching and nursing. But there’s a new collar color on the horizon that cuts across these class and gender distinctions. "Green collar" jobs include any occupation related to environmental issues: the category encompasses lower-wage solar panel installation positions all the way up to high-paying research and executive positions. 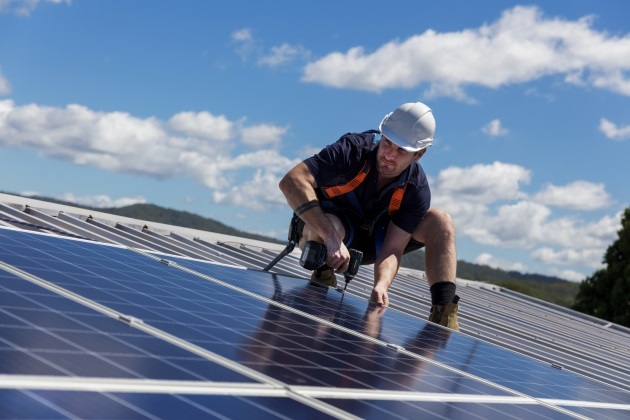 The common theme is that all green-collar jobs relate to improving environmental conditions, and this means transitioning to a clean economy fueled by renewable energy sources like solar, wind, and water. In recent months, we have heard much about the Green New Deal, named after President Franklin Delano Roosevelt’s New Deal that delivered jobs and social support programs, including Social Security, during the Great Depression in the mid-1930s. Europe introduced the idea of a Green New Deal in 2006, and now the U.S. has begun debating transitioning to green-collar jobs as well. Strident supporters of the idea of a sustainable clean energy economy may feel demoralized after recent legislative setbacks for the Green New Deal, but the idea of green-collar jobs is not going away. Even some Republicans have proposed a Green Real Deal that addresses climate change science and clean energy job initiatives. While the Green New Deal proposes creation of "20 million new, living wage jobs," this effort will be caught up in partisan wrangling for some time. While we wait for federal relief, some states are leading a transition to a greener economy. Indeed lists Vermont, Alaska, Wisconsin, Kentucky, North Dakota, D.C., Montana, Wyoming, California and New Jersey as the top 10 states with the best green-collar opportunities. Due to budget cuts to the Bureau of Labor Statistics (BLS), it’s more difficult to track green-collar job growth today. The U.S. Labor Department classifies 3.1 million workers as green collar. This includes "800,000 Americans employed in low-carbon emission generation technologies, and 2.25 million employed in energy efficiency. This compares to only 92,000 for coal-fired generation." This same report states solar-related jobs have grown by 168 percent in the past seven years, and one of the fastest growing jobs is wind turbine technician. Globally, there is also a rising interest in green-collar fields. A recent National Geographic article lists the top growing green-collar jobs globally: urban growers, water quality technicians, clean car engineers, recyclers, natural scientists, green builders, solar cell technicians, green designers, wave energy producers, wind energy workers, and biofuel energy jobs. While green-collar job growth is corroborated by recent reports, a challenge remains finding skilled labor in fields transitioning toward green solutions. Also, when budgets run tight, green job training subsidies, infrastructure projects, and other initiatives are the first to be cut. While some think the Green New Deal’s 2030 goal of 100 percent clean energy may be too optimistic, numbers suggest that 3.9 million "conventional energy sector jobs" could be replaced with clean ones to the tune of "3.9 million 40-year construction jobs and 2.0 million 40-year operation jobs for the energy facilities alone." Recent data suggests green-collar jobs are growing options for more Americans. The range of occupations alone is reassuring here: specialists; health and safety officers; technicians; managers; water treatment specialists; renewable energy technicians; engineers; and scientists. Given the above list of available green-collar fields, the challenge here is not occupational diversity. Instead, the challenge will be avoiding a bifurcated green-collar job market of high paid professionals and low paid workers mimicking today’s existing class divide. Living wage demands and climate change concerns are here to stay. The Sunrise Movement highlights young people’s interests at a time when President Trump’s budget proposal undermines ongoing efforts. "In all, the proposed budget would cut 86 percent of new spending for the Energy Department and labs' work in energy efficiency and renewable energy, going from nearly $2.4 billion to a proposed $343 million," states Inside Climate News.